Update : this bug was fixed in the Update 4 of Delphi XE2. 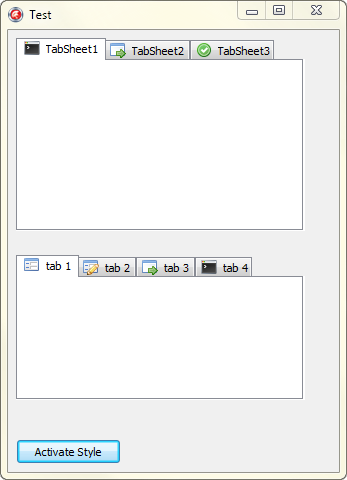 In the above image, the form contains two components a TPageControl and a TTabControl, and both has an imagelist associated. Now if you change the VCL style of this form you will get this result. As you can see when the Vcl Style is applied the images associated to the tabs are changed. So after a few minutes debugging the source code of the VCL when the Style is enabled, I found the issue in the DrawTab method of the TTabControlStyleHook class. This class is the responsible of call the drawing functions (of the TTabControl and TCustomTabControl) associated to a particular VCL style when and Style is enabled. As are you noted the problem is which the DrawIcon method is called passing the Index of the tab and not the index of image associated (imageindex) to the tab. So what I can do now?, First I report the issue to the Quality Central, and the I begin to work in a temporal solution until this problem was fixed by embarcadero. The Fix was create a new Style Hook class and register this class to be used by the style manager when a TPageControl or TTabControl are painted. function GetImageIndex(TabIndex: Integer): Integer;//helper class to retrieve the "real imageindex"
//this function retrieve the "real" image index of a tab based on the tab index. Now before to use this new class in our code we need to unregister the original style hook class and then register the new one, using the UnRegisterStyleHook and RegisterStyleHook methods, check this code. I hope which this short article was useful for you, and you see one of the uses which you can made of the RegisterStyleHook and UnRegisterStyleHook methods ;). Check the sample project source on Github. Hi, I’m trying to disable the 3D appearance of one TPageControl. Any suggestion? At design-time all TPageControl are displayed like your first image (Windows_Style), but at run-time they become 3D, like Windows XP appearance. I need the TPageControl to remain like Windows_Style, because all mine controls have Ctl3D := False. Thanks for response. I thought there was a easiest solution. I found the cause of that behavior I told you. In the project options of our application we have the Runtime Themes option marked as None. 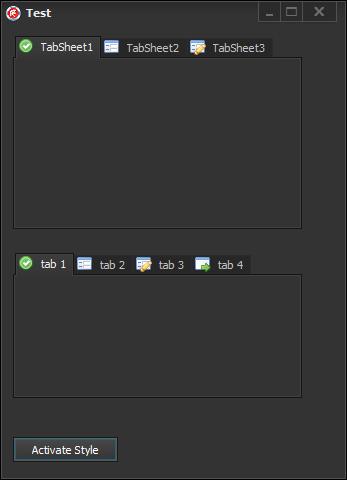 Any suggestions on how I could enable the theme only for a TPageControl?